There are two parts to presentation: advertised and actual. 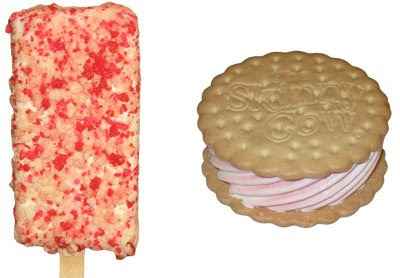 Advertised: As you can see, they both look pretty tasty, though if you were going for authentic strawberry shortcake taste, you'd probably be tempted to go with the Good Humor bars. GH also has the advantage of being on a stick, so you might assume it's a less messy treat. Actual: It looks like someone sat on the GH treat after someone half-heartedly sprayed it with shortcake bits. On the other hand, the Skinny Cow treat looks very similar to advertised which is always appreciated. The bits do make the mind think that GH could still be more tasty, but the bare spots also make it look cheap while the SC treat has a nice clean cut look. Winner: It's very close, but I'll give this one to Skinny Cow. The Good Humor treat describes itself as cake coated Vanilla light ice cream and strawberry flavored center. And it is what it is, the cake flavor is mild, the overall strawberry flavor is ok, and for some reason sometimes I think I taste cheesecake. Yeah, I don't know, but that's what my brain tells me (must be the bits). The Skinny Cow treat describes itself as a "low fat swirl of strawberry and vanilla ice creams scooped between sweet vanilla wafers". Surprisingly enough, I liked the wafers. They are very similar to what you might find in a vanilla cookie, in fact, the whole thing reminds me alot of a giant cookie, and that's not a bad thing. Well, technically, it's suppose to be strawberry shortcake, not strawberry shortcookie, but still, I like it. The cookie to ice cream ratio is a lot closer then in the GH treat, be prepared to taste a lot of cookie (but that's kinda what I was hoping for when I saw these). Winner: The skinny cow isn't fantastic, but I liked it enough to consider buying them again in the future. The good humor was ok, but I won't buy them again anytime soon. So the winner is Skinny Cow. I was expecting to wind up with cookie covered fingers after I ate the Skinny cow treat but surprisingly enough I stayed clean. This is a million times better than their chocolate cookie based treats that instantly stick to your fingers. The Good Humor treat has the benefit of the stick to keep your fingers clean, but eventually you get to the point where the stick gets in the way. Those last few bites can be a little dangerous and could wind up in your lap or on your shirt. Also, the skinny cow was crumb free while the Good Humor bits were flaking off now and then. Just a few, but it only takes one strawberry bit to get a lovely red stain on your nice clean clothes. Winner: Again close, but again, I say Skinny Cow. Good Humor: 60g total weight, 160 calories, 70 fat cals (2.5g sat fat), no fiber, 1 g of protein. In a "shocking" upset, Skinny Cow! When I saw these in the store, I was actually kind of excited. I think strawberry is the key to low cal treats. Don't pretend like your chocolate tastes good, focus on something that's easier to make low cal, like strawberry. They aren't fantastic, and as always, the skinny cow "ice cream" leaves much to be desired, but cutting it some slack since it's a low cal snack, it's a decent treat. Great photos, Dubba. And not just on this entry, but all of them. I like the clean, white background look! thanks! I've been trying to take better photos as well as updating older photos. It's definitely something that takes practice (especially during the summer when the containers keep frosting over when I take them out), but I'll keep trying! I just bought a Good Humor Strawberry Shortcake from the gas station and it is 4oz bar. 230 calories. 10gram fat. 2g protein. 32 grams carbs. I feel fat already, but it is so nostalgic good.